LAS VEGAS, APRIL 5, 2018 – Wisycom, designer and builder of the most sophisticated RF solutions for broadcast, film and live production, premieres its LFA Ultra-Wideband Active Antenna (LFA) and BFA-B/BFA-N Ultra-Wideband Booster (BFA) at this year’s NAB Show (Booth C856). The new antenna hosts tunable filter technology and a remote controllable booster, which is designed to supply optimal range and control through wide reception bands and high dynamic range RF gain, resulting in maximum coverage area for its users. 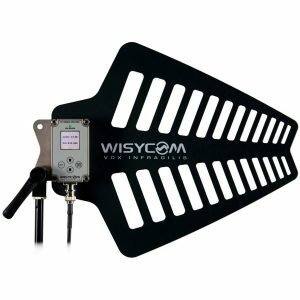 Wisycom’s LFA is a directional ultra-wideband antenna that operates in the 410-1300 MHz frequency range. It provides a typical gain of 7dBi, with a 3dB beam width of 120-degrees horizontal and 90-degrees vertical. It integrates a new and unique bank of tunable filters for the ultimate RF system protection, along with a remotely adjustable low noise amplifier with an RF level range from -12db up to +27db gain (1db step selection). The LFA antenna features three filters including high and low band pass, tunable and fixed bands. Filters/gain can be easily setup through four key navigation buttons and a TFT display. The LFA and BFA can also be controlled and setup remotely through the MAT288 and 244 allowing operators to make changes at the receive location. Operators can also remotely manage all antenna systems from the company’s Wisycom Manager 2.0 software. The antenna is equipped with a compact, rugged form factor to reduce wind resistance. Wisycom is a designer and builder of the most sophisticated RF solutions for broadcast, film and live production, renowned for their durability, flexibility, reliability, practicality and cost-effective price points. Wisycom’s design process is driven by attention to detail, customer feedback and ultimate quality, from the selection of components to the manufacturing process, which takes place at the company’s Italian plants. The company prides itself on serving as a technical advisor and partner to every customer. From custom design to evaluation and dimensioning of systems, the Wisycom team stands by its customers through every step of the process. 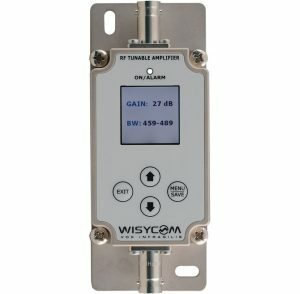 For more information, please visit www.wisycom.com and/or www.wisycomusa.com for those customers in North America.